The formula with Phyto-Keratin® complex, containing plant-based proteins and active fruit concentrate, and cupuaçu butter, with natural lipids, works in two ways to build healthier, stronger hair and protect from future damage. 90% of Hair's Strength Reconstructed from Root to Tip* with this hair strengthening treatment for damaged hair. 2X the Damage Resistance. 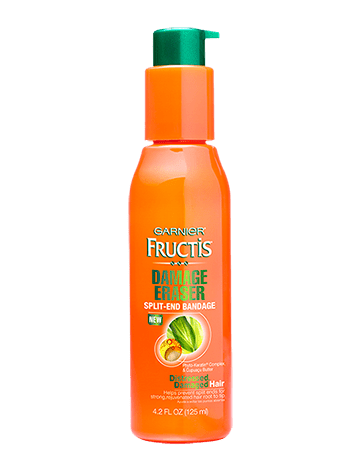 * Garnier Fructis Damage Eraser System of Shampoo, Strength Reconstructing Butter & Split-End Bandage Treatment in a brushing test measuring breakage vs untreated hair. Apply on towel-dried hair to fragile or damaged areas. Do not rinse out. In case of contact with eyes, rinse them immediately. For Best results, use with the Garnier Fructis Damage Eraser System of Shampoo and Conditioner. Rated 5 out of 5 by Bayou Cat from Fabulous - WHY disontinued?!!???? I also love this product!!! It works like nothing else for the dry ends of my colored hair and smells wonderful! Why, oh WHY, would you discontinue it?!!? PLEASE bring it back!!!! Rated 5 out of 5 by DamageEraserbandageScent from Fragrance I LOVE this scent and I’m sooo sad they discontinued the shampoo, conditioner and this product!!! I’m desperate to find out how to get this fragrance?????? Rated 1 out of 5 by melani from BRING BACK please bring it back!!! the new replacement is HORRIBLE!! bring it back the only product that actually works!!! will not be buying garnier anymore! do you not listen to customers???? Rated 5 out of 5 by Carol59 from Split- End Bandage I have been using this for a long time. Now you discontinue it. Just so you know, I like it better than the new stuff you replaced it with. I will no longer be buying the new replacement product. Obviously there are a lot of people who like this. I think you should consider bringing it back. Thank you for listening to me. Rated 5 out of 5 by Meli123 from Great Features! I've been using this product for the past two years. This helped fortify my hair, allowing me to grow it out with less split ends. I was kind of disappointed to find out that they are not selling it anymore as I'm coming to the last few pumps.